Looking for a job that pays well and always seems to be in demand? If so, you may want to consider a career as an HVAC technician. An HVAC technician, also known as a heating, air conditioning, and refrigeration mechanic and installer, installs, maintains and repairs heating and cooling systems in a variety of settings. Learn what the current job outlook is for HVAC technicians as well as what it takes to become an HVAC tech. The U.S. Bureau of Labor Statistics (BLS) predicts a very favorable job outlook for HVAC technicians. According to the bureau, these professionals can expect employment growth of 14 percent during the decade of 2014-2024. Those who complete formal training in college or through apprenticeships typically see the best career opportunities. HVAC techs usually see more work during the construction season when they’re in demand to install new systems. While their workload may decrease after the construction season ends, they remain in demand for maintenance and repairs because cooling and heating systems are necessary year round. New U.S Environmental Protection Agency (EPA) regulations regarding refrigerant pollutants also keep HVAC techs busy modifying and upgrading existing AC systems. Unlike some jobs that require the employee to work in a controlled setting, HVAC technicians have the option of working as part of a HVAC company or striking out on their own as independent contractors. They also can obtain training to work in residential homes, commercial buildings or in public facilities like schools and hospitals. Several factors can affect earning potential, such as years of experience and training; number of certifications; employer and geographic location. A May 2016 BLS report states that HVAC technicians earned a median annual salary of $45,910 nationwide. Those in the lower ten percent earned about $28,440 while those in the top 90 percent earned $73,350. Payscale.com reports the hourly wage for HVAC technician’s ranges from $13.90 to $30.42 with $20.22 being the average as of July 2017. The same factors that can affect job outlook can also play a large part in affecting wages. Below are the top five states in terms of annual mean wages as of May 2016. Florida is the state with the highest number of HVAC technicians employed (28,770) in 2016, but they only earned an annual wage of $40,660. District of Columbia, which has the highest wages, only had about 330 HVAC technicians employed that year, according to the BLS. 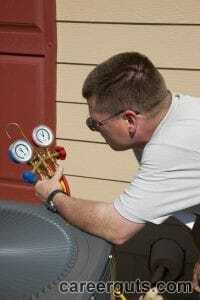 Another factor that can increase an HVAC techs wages is overtime. Because heating and cooling systems tend to break down during the coldest and hottest days of the year, the HVAC tech will often be required to work in the evenings, weekends and even on holidays. What Does it Take to Become an HVAC Technician? To become an HVAC technician, one must complete some formal training. 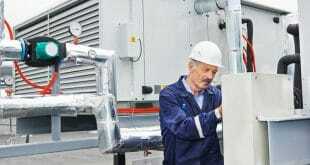 There are different paths towards becoming and HVAC technician. Although this is not as common as in the past, some HVAC technicians receive their training through on-the-job training while working under the supervision of a trained and certified HVAC technician. Many HVAC technicians complete their training at vocational schools or community colleges. The programs, which offer certificates or degrees, may take from six months to two years to complete. The programs include a blended curriculum of classroom assignments and on-campus laboratory work. Students often end their training with internships at local HVAC businesses. Apprenticeships are probably the most comprehensive training of the three, but they offer extensive hands-on training. Apprentices typically must complete at least 144 hours of technical education and at least 2,000 hours of hands-on training. Apprenticeships generally take three to five years to complete. There are several certifications available to HVAC techs once they’ve completed training. The more certifications the individual earns, the better the job and salary opportunities the HVAC tech will find. The following agencies offer certification exams for aspiring HVAC technicians. Additionally, HVAC technicians who work with refrigerants are required by the EPA to obtain certifications in whatever specific area they wish to work. Many states require HVAC technicians be licensed, which involves obtaining certification. Although the positive outlook for job opportunities may be the driving factor behind becoming an HVAC technician, there are other reasons why one might pursue this career. Previous How Much Do Mechanics Make? Next How Much Does Mechanics School Cost?